Looking for the Best Outside Activities For Preschoolers And Toddlers? Here is a list of outside activities for preschoolers and toddlers, recommended for ages 3-6. As always we suggest that all games be supervised by an adult. Many of these activities for preschoolers we have played together with our children. We hope you enjoy them as much as our family has! *Stop And Go: Outside Activities for preschoolers should not only be fun, but also help to develop physical and mental discipline. 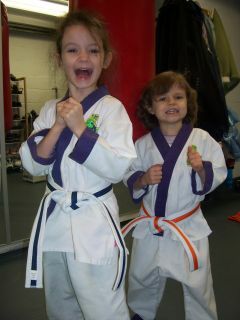 This is an activity we have adopted from our martial arts teacher. We have all had our heart stop when our child has run toward a busy street. This is a wonderful and fun way to show the importance of listening to appropriate commands. Have the children line up in a running stance. When you say the word "Go" they run a course you have laid out. They keep running until you say "Stop". Now the fun begins when you switch it up on them, by using other words such as freeze, slow down, walk, run and so on. They only should respond to Stop or Go. Whoever misses the call must sit out. This continues until there is only one child left, and that child is the winner. All my children have responded well to this and now when they hear the word stop, they Stop! *Backyard Mazes: My kids love this! Set up an obstacle course in your back yard with some lawn chairs, kids' toys or buckets. Anything in the back yard can work for building the maze. After you have laid out the course, allot a time the child must finish it in, or time each child to see who is the quickest. For the older ones, make them carry an egg or a cup of water through the maze. Also quite humorous if the parents get involved! *Cardboard Mazes: Start saving your used boxes and cardboard, and they can keep your children busy for hours! Help by cutting open different sides of the boxes and joining them together to make tunnels. The bigger boxes make great play houses and can be tied into the tunnels/mazes. You can cut holes for windows or doors and even have them paint their creation. Provides hours of very inexpensive and creative outside activities for preschoolers. Side note--Most large local retailers are happy to give you boxes, they usually throw more away than they can use. *Jumping Rope: Tie an old cushion or sock filled with dried beans to the end of a long string. Swing the rope around close to the ground, and have the children jump over the rope. If they are hit, they must sit down, and the last one standing is the winner! *Sack Races: First, make a start and finish line. If you have access to burlap bags great, if not, small garbage bags will work. Make sure they are supervised-the children should not be allowed to use them for any other purpose! Have them put both feet into bag, while holding onto the sides. The object is to see who can hop the quickest to the finish line. Very fun to watch! This outside activity for preschoolers is great for a birthday party or picnic! *Bean Bag Toss: Start by using a hula-hoop or a large bucket and place them a reasonable distance apart. If you do not have any bean bags, you can make them easily with some old socks. Take the sock and fill will some dried beans and tie off the ends. Make at least three to four bags. Have one child at a time throw each bag and try to place in bucket or hoop. The one who gets the most in wins. Game can be played individually or divide into teams. If it becomes to easy for them, try moving the bucket or hoop farther away. *Simon Says: First choose someone to be Simon-usually an adult or parent. Have the children stand in line, and with the phrase "Simon Says", ask them to do something. Such as: "Simon Says stand on one foot", or "Simon Says touch your nose". Have fun with this, you'll get many laughs with this game!! Now simply ask the children to do a move without saying Simon Says. Did someone move, and Simon didn't say? "oops" they must sit out! This continues until only one child is left standing, he or she is the winner. *Hide and Seek: First, choose who will be the hunter/seeker and who will be the hunted. Next, depending on your yard size, establish the hiding boundaries~ you don't want the younger ones wandering off into neighbor's yards! Begin by having the hunter/seeker count to ten while everyone else finds their best hiding spot. If you find yourself running out of time to hide, increase the number the hunter/seeker counts to before looking for everyone. Whoever is found first becomes the next hunter/seeker, and so the game continues. I love this for helping the younger children learn how to count. You can skip-count by one's, two's, five's, ten's, etc- No peeking allowed!! *Tag, Your It! : This is a classic and very simple. Having a large yard with lots of children makes this game tons of fun. Pick someone to be "It." This person chases everyone until someone is caught. This caught person now becomes "It" and must catch someone else. This continues until everyone is exhausted and ready for naps!! It is then, that we as parents get our well-deserved break! *Duck Duck Goose! : This is my two year olds favorite! Gather everyone around in a circle and sit down. Have one child or adult be the Duck. Walk around the circle repeating Duck-Duck-Duck while tapping each person individually on the head. When you have someone in your sights to be the goose, you tap that person on the head and say Goose!! This person must jump up and try to catch the Duck, while running around the circle. When caught, this person now sits and the process repeats until everyone is bored or tired! *King Of The Hill! : Dad Is King of the grassy knoll~ how long before he wears out from four little ones pulling and pushing him down the hill? My son is always so proud after he finally gets his glory at the top of the hill. Traditionally, one child stands at the top of a hill, sandpile, or wood chips, while the others take turns at bringing him/her down from the top. The person who succeeds in bringing that child or adult down is now King Of The Hill. *Follow The Leader: Line the children up and enlist one of them to be the leader, whatever the leader does, the rest must do! For the younger ones you can call out the moves for them. You can have lots of fun with this! Make them jump on one foot, bark like a dog, skip while patting their head with one hand, and so on. The older ones can make up their own moves. You will have many laughs with this game! At this age it is very beneficial for their coordination and listening skills. 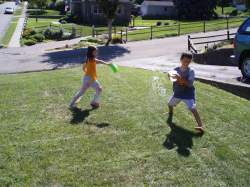 *Water Balloon Toss: Fill some small balloons with water and have two, even-membered teams face each other. Take one step back and toss the balloon to your partner across from you. Keep taking one step back and then tossing the balloon until someone misses and gets all wet. Object is to see who can get the farthest away from each other and still catch the balloon without breaking it!! *Sticks & Stones: First form two even teams, one is Sticks and the other is Stones. Have them stand in two lines facing each other, only a few feet apart. Behind each team (by about 30 giant steps) is a safeline. The referee yells "Sticks" and the sticks take off after the stones who hightail it for their safeline. Any that get caught have to switch sides. Then they reform their lines and do it again. *Soap And Water: My children always love to do this while I'm washing the cars. 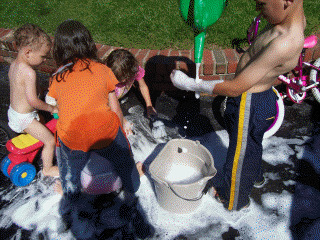 Make an extra bucket full of soapy water and let them have a blast! Give them a sponge and brush, and let them wash their own toys. My son would wash his Tonka truck or his bike, but they all usually ended up with most of the bubbles on their head! Refreshing outside activities for preschoolers, for those "hot" summer days! *Sponge Targets: With sidewalk chalk, create a target on your block garage wall. A brick wall would work too! Take a car sponge and cut into smaller pieces and fill up a bucket of cold water. Measure a distance of your choosing and draw a line. Now let the children have a blast throwing the wet sponges at the target. Keep taking turns until the target is washed off. 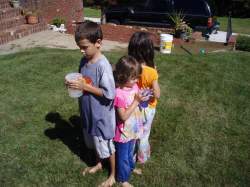 *Water Tag: Fill a large bucket with water and supply every child with a plastic cup. Place the bucket full of water in the middle of your yard, and have them fill their cups. Now have them stand with their backs facing the bucket and each other. When you give the command have them take five steps forward and then say "Go". Make sure you get out of the way, unless you want to get wet too! More great outside activities for preschoolers to come, please check back often! Having Fun with Outside Activities For Preschoolers!